1. Before class use a ruler to mark off four-inch sections on the pool noodle. 2. Cut the pool noodle at each mark with a serrated knife making cylinder shapes. Then cut the cylinder shapes in half, lengthwise to make the holders. 3. Cut a slit at the rounded top of the holder lengthwise across the center of the cylinder about 1/2" deep. Use this slit to hold Bible verse card. 4. 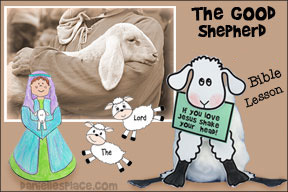 Print out the Bible verse cards onto card stock. 5. In class have your children decorate the holders with liquid chalk markers and foam shapes, and place the Bible verse card in to holder. This chain can be used to teach children about the importance of prayer. Make two chains, one for prayer requests and one for prayers answered. Have your children write their prayer requests and the date on the front of the hearts and link them together under a piece of paper that says "Prayer Requests". Start another chain for prayers answered. When a prayer has been answered remove the link from the "Prayer Requests" chain, write the date it was answered, and put it on the "Prayers Answered" chain. 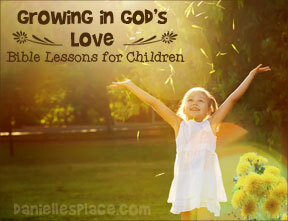 Your children will begin to see how God answers their prayers. 3. Cut open the "Y" shaped lines in the center of the link being careful not to cut all the way through. To make cutting the slit easier, fold down the handle so that the lines overlap trying not to crease the paper to much. Cut through the paper, unfold, and finish cutting the line. 4. To add a new link just slide the bottom heart of the chain behind and through the slit on the new link. 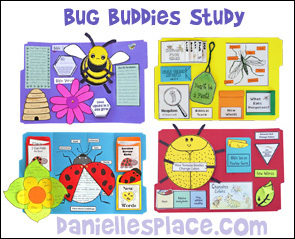 You can also use this craft as a memorization tool. 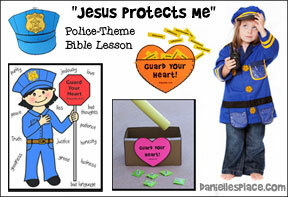 Have your children write one word of the Bible verse on each heart and then chain them together in order. 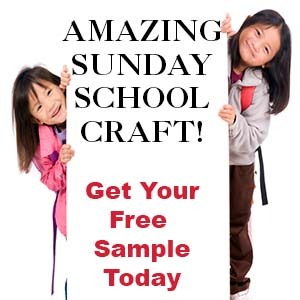 Older children who love to express themselves with art will love this craft. Using a phone book page as their canvas children can experiment with different designs. 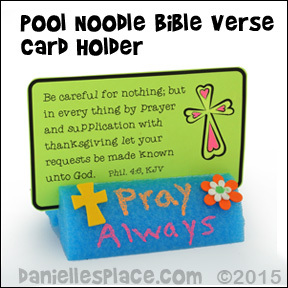 The back of the bookmark contains Bible verses that may help them with their prayers. The verses cover fear, anger, loneliness, and friends. Colored Pencils - Prismacolor Colored Pencils Work Best! These are very soft lead pencils and cover very well. 1. 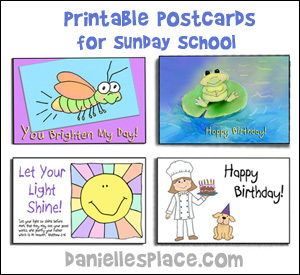 Before class print out the bookmark patterns onto bright color card stock (heavy paper). A Pattern for the back of the bookmark and the front design picture to the right are available to members on The Resource Room.) If you aren't using the patterns, cut 3" x 8" rectangles from the card stock. 2. Cut the phone book pages into 2 3/4" x 7.5" rectangles. These are a little smaller than the back pattern so that the edge of the phone book page side will have a colorful boarder. 3. In class have your children use markers, pens, and colored pencils to draw a design on the phone book page and then glue them onto the back of the bookmark piece. 4. 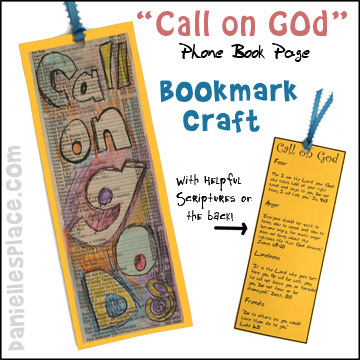 Have them write Bible verses that will help them with their prayers on the back of the bookmarks if you aren't using the pattern. 5. When your children are done with their bookmarks you can laminate them or cover them with clear contact paper and then punch a hole in the top and add a ribbon. 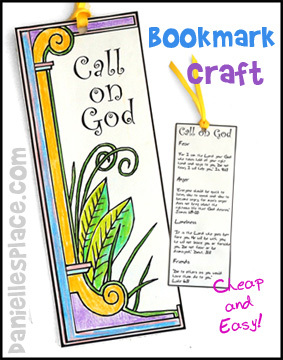 The patterns for these bookmarks can be found on The Resource Room and go along with the Bible lesson "Call on God". 1. Before class print out the cup cover patterns and make copies. 2. 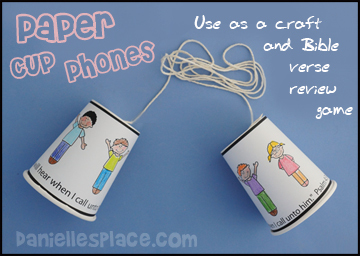 Make enough paper cup phones so that you have one for every child. Poke holes in the bottom of cups with a large needle. Thread kite string or other string through the holes from the outside to the inside of the cup using the needle to poke the spring through. Pull the string through the hole with tweezers. Tie knots in the end of the string and cut off the end of the string up to the knot. Pull the string back through the cup so that the knot is tight up against the bottom of the cup. Thread the other end of the string through another cup. Make the strings about 6 feet long. 3. In class have your children color the cup cover pictures and then tape them to the cups. If you aren't using the cup cover patterns, you can just have your children decorate the cups with stickers or magic markers. 4. Have your children sit or stand in two lines that are opposite each other. Each child should have a cup from his set of phones and a cup from another child's set in his hands. The first child should hold a cup from the teachers set in his hand. The teacher speaks through a cup to the first child who has the other cup to his ears. The next child repeats what the teacher said to the child opposite him. Keep going until all the children have had a turn. Tell the children that they should be speaking through their own cups and listening with another child's cup. This way they are not putting their mouths on the other child's cup. Remind your children that they have to hold the cups so the string is tight (don't let it sag in the middle) and put the cups up against their cheeks with their mouths inside the cup for the phones to work properly. Have them practice telling each other and listening to hear the Bible verse. Also remind them not to touch the string with their hands when holding the cups. These phones work very well if your children use them properly. It is hard for younger children to keep the string tight as they hold the cups so you may want to talk to each child through a different set of cups if they are having a hard time. a. Do you talk to God as much as you talk to your friends on your phone? b. If you could talk to God on the phone, would his number be in your favorites? c. How many bars do you have when you try to talk to God? Is the connection good? On the word "go" see who can dial God's number the fastest. 1-800-ASK-RGOD. 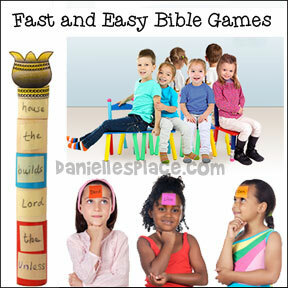 Children use the process of illimination to figure out the Bible verse. Available in both KJV and NIV. 2. In class hand out the sheets and tell your students to use their phone pictures to figure out the Bible verse. The vowels are already given. They will have to use the process of elimination to figure out the other words. 3. When your children are finished or can't figure out any more words, have them look up the Bible verse in their Bible to check their work. 1. 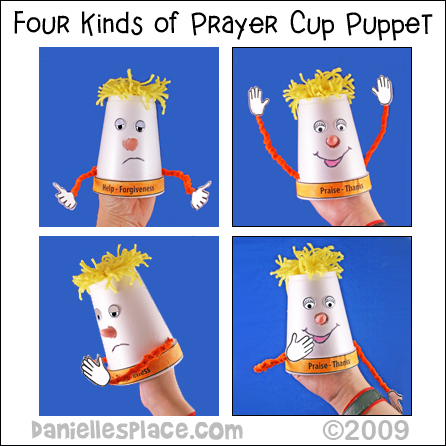 Before class print out the four different kinds of prayer strip and the hand patterns onto colorful paper. 2. Make puppet hair by winding yarn around your four fingers about 25 times. Pull it off your fingers keeping the yarn in the same shape and tie the yarn together in the middle with another piece of yarn. Cut the looped ends to make a pompom. 3. In class have your children glue the word strip around the rim of the glass and the hair to the bottom of the cup. 4. Draw a sad face on one side of the cup and a happy face on the other. You can use googly eyes or eye stickers if you have them. 5. Use a pencil to draw a hole for the nose. Make it large enough for a child's finger to fit through. Punch the nose out by poking the pencil through the foam. 7. Wind the ends of the pipe cleaners together to make the arm. Glue a hand to the end of the pipe cleaner and another hand on the other side of the hand to cover the end of the pipe cleaner. 8. Have your children move the arms to represent each type of prayer. The hand is placed in front of the mouth with the thumb up and then moved out from the face to represent thanks. This is how you say, "Thank you." in sign language. 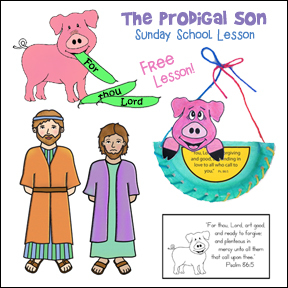 This comic book style activity includes four pages and a cover page with pictures of four different kinds of prayer including: forgiveness, praise, thanks, and asking for help. Children look at the pictures in the comic book and decide what the children in the pictures might be praying about then fill in the speech balloons. 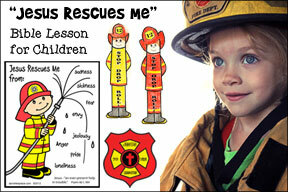 Children Match the icons to figure out the Bible verse. Each icon represents a different word. 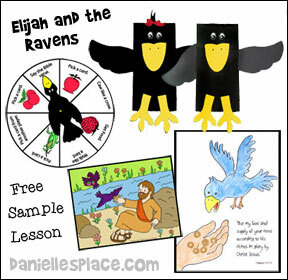 This craft goes along with the Bible lesson "Back to School with a Leap" on The Resource Room. The lesson uses the book "Froggy Goes to School" with frog-themed games and crafts. 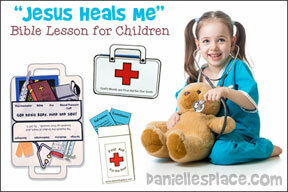 In this lesson children learn that we need to be prepared for school so that we will be successful. Not only do we need the right clothes and supplies, but we need to prepare our hearts and minds. 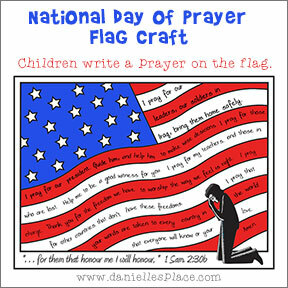 United States Flag Craft - The National Day of Prayer is on May 3rd. For more information, you can go to the National Day of Prayer Web Site. 1. Print out or draw a picture of a flag with someone praying in front of the flag. 2. Color the flag and then write your prayer on the stripes of the flag. Use this craft when you are studying about prayer. The Lord's Prayer or the Prayer of Jabez or any other prayer can be written on the hands with gel pens. 1. Before class print out the patterns of the praying hands and the stained glass window. 2. Before class use the praying hands pattern as a template to cut shapes from black paper. 3. Show your children how to fold the stained glass window sheet at odd angles and then unfold and fold it again until they have a paper with lots of irregular shapes. 4. 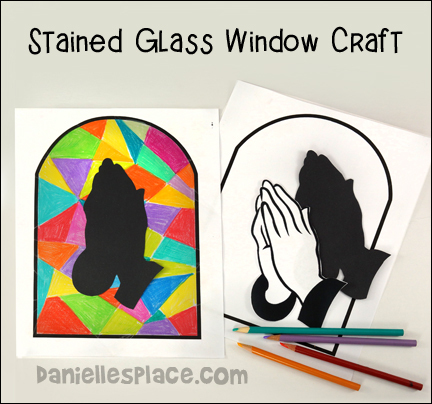 Tell them to color in the shapes with different colors of colored pencils to make a stained glass window. 5. Older children can use light-colored pencils to write a Bible verse about prayer on the praying hands. 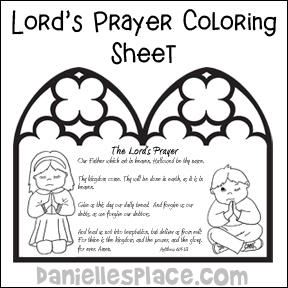 Teach Us To Pray Web Site has lots of printable coloring pages on the Lord's Prayer and other activities to teach children the Lord's Prayer. This Lesson series includes craft and activities for each verse of the prayer. You don't have to worry because God is just a prayer away. God will always listen to your prayers, and he cares about you and loves you. This lesson was written for younger children. 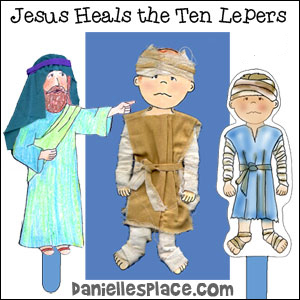 They learn how important it is to pray using Jesus and Daniel as examples. 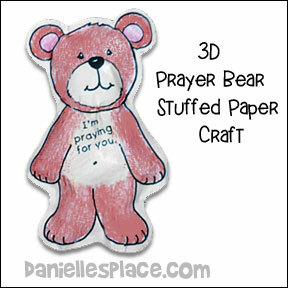 Children can make a stuffed prayer bear that says, "I'm praying for you." Just print out the back and front patterns onto printer paper, glue the sides together, all except the bottom. Color the bear and then stuff it with small pieces of tissue paper. Then glue the bottom closed. Give the prayer bears to people in need of prayer. 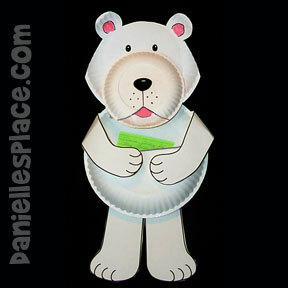 Children can use this cute paper plate bear to store prayer requests. 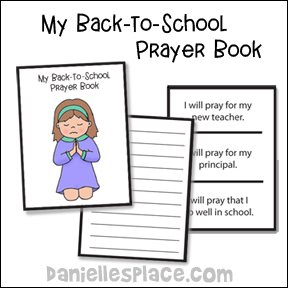 Have the children place their prayer requests inside the pocket. Just print out the pattern and have your children color the picture. Cut out the window shapes and fold the paper in half. Spread out the sides so that the picture stands up. And He hears what I say. If you like these songs, consider purchasing "Praise 4 God ~ Just 4 Kids©"a collection of more than 75 simple songs and poems of praise. This lesson is taught using plastic cross containers and color Sandy Candy. Our Father who is in Heaven - The first thing Jesus said was, "Our Father in heaven", Some Bible Translations say "Our Father, who ART in heaven." That means our Father who is in heaven. Let's put some gold into our tube to remind us of heaven. The Bible tells us that the streets of heaven are made of gold, so the gold will remind us of heaven and how we should start our prayer. Jesus is the King and we use purple to stand for royalty. The kingdom that Jesus is talking about is now in heaven, but at the end of the world it will also be on earth. When you see the purple, you can remember the kingdom of God. For the complete lesson click on the link above. 1. Display a variety of baking ingredients and a recipe for bread. Include ingredients that would not go into a bread recipe. Discuss what would happen if we didn't use a recipe as beginning bakers. Then have the students decide which of the ingredients belong in the recipe. Explain that Jesus gave us an example of a prayer to use as our guide when we pray. If time permits, students could make the bread. Otherwise, the leader could make the bread at home and bring it back when the "daily bread" portion of the prayer is discussed. 2. "Thy Kingdom Come" - Make a Christian Flag - Go to Fbcfay.com web site for a picture and the history of the flag. 3. 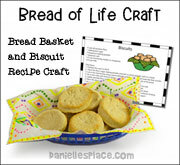 "Give us this day our daily bread" - Decorate a napkin and place in a bread basket. Encourage your students to make bread at home to place in their baskets and give them to a neighbor. Kids Rug ABC Blocks Area Rug 3 Ft. x 5 Ft.